*Average weight with 28" barrels. Weight may vary based on wood density. Syren’s mission is to create firearms that exceed the expectations of the modern huntress. With the Syren XLR5 Waterfowler, we created a shotgun that performs unlike anything currently available. First and foremost, it has to fit properly. We utilized our expertise in women’s stock dimensions to create a shotgun that fits better than any standard men’s or youth model. To make the gun easy to carry and balance properly, we reduced the weight to 7 lb. 1oz*, allowing for a smooth mount and easy handling in the duck blind or boat. To address recoil, the XLR5 utilizes a stock designed to fit the female anatomy and a recoil reducing, gas operating system to take the punishment out of modern high-performance waterfowl ammunition. The XLR5 Pulse Piston™ gas operating system accomplishes recoil reduction by bleeding off pressure as the gun cycles. 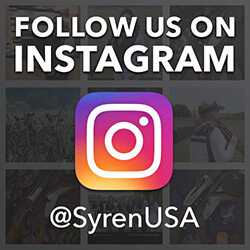 The Syren Waterfowler has been carefully engineered to provide the huntress with the ideal shotgun for creating hunting memories that last a lifetime.